Little Z is usually happy to be running about in a crowd of children skidding about on his knees and screaming and yelling at the top of his voice. He’s not really one to sit down unless Despicable Me 2 is on and he has a packet of crisps in his hands. His favourite movie with his favourite snack. Having numerous cousins, he loves being the centre of attention and, being the youngest, his cousins are happy to oblige most of his requests. Until of course he wants to have a go on the playstation or something similar. He will work hard to get his own way though, usually by pleading “please…please…pleeeeease”. repeatedly. Relentlessly. These rules are not practiced with two particularly special individuals however. One girl cousin and one boy cousin. They can do no wrong in his eyes. All toys are instantly shared and all games must be played with them. He will burst through their respective doors and ask about their whereabouts. Then proceed to glue himself to their hip for the duration of the stay. They will happily oblige with the gluing. They are like magic cousins. He will listen to them and will even eat up all his dinner if told to by them. I have on numerous occasions had to engage their sorcery to get Little Z to fill his belly. He is the apprentice to their sorcerer. (Kinda like the Mickey Mouse version with the hundreds and hundreds of mops and water all over the place). It is like watching a little world where other children could bring your own offspring up. Not that I’ve been tempted or anything, of course. It’s a joy to watch his cousins caring for him in such a manner. It seems Little Z returns the favour in different ways. A couple of weeks ago the Other Half recounted how Little Z had scratched another cousin. Something he rarely does but is, nonetheless, mortifying to hear about. Why or why? We did the whole explaining how it is wrong to scratch someone and how it hurts and makes people sad and tried to get to the bottom of why he would randomly lash out at someone. Apparently this particular cousin had been calling his ultra special cousin “funny words” (a girls name) and he felt it right to protect him. We’re not quite sure when he started understanding name calling let alone turning into a little bodyguard for someone. Each trip out now has a prerequisite pep talking about how scratching is bad and thankfully the little wolverine antics haven’t been repeated. The special relationship with his two favourite cousins still continues though. 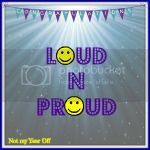 I’m hosting Loud n Proud this week! If you’d like to join in this week then grab the badge and link up your favourite proud moments below. Old, new, big, small, all proud moments welcome! The linky will stay open till Sunday night. This entry was posted in Toddler and tagged 3 year old friendships, 3 year old scratching, 3 year olds, favourite cousins, friendship, Parenting, threenagers. Bookmark the permalink. That’s so lovely that he’s so caring. My kids have such a special relationship with their baby cousin too – it’s lovely to see. They’re always there to stop her hurting herself/ running away and will pick her up, carry her and kiss her. WallyMummy recently posted…DIY Tips for Toddlers.